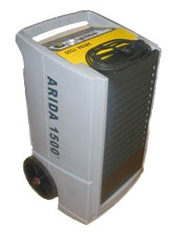 The Arida 1500 dehumidifier is among the most advanced air dehumidifiers currently available. The rotation-formed plastic casing is highly resistant to impacts and breakages. It is also fire-resistant and extremely resistant to mechanical damage. A large, clear operating panel and a cable winder make the unit very easy to use.